Ever since the Great Debacle of 2007-08, we have all had house prices on our minds. Other topics may be grabbing headlines, but there has always been a recurring interest in how the old US residential market is doing. And there are good reasons for that. Not only is it a massive asset class, representing a sizeable portion of our national wealth, but for many families the house is the single biggest asset, often exceeding the value of the household’s net worth. And housing is, after all, where this whole nasty economic mess started. Lately the house theme has been about whether now is the time to jump in and buy. Two days ago Time decided to share Why This May Be the Ideal Time to Buy Real Estate. That echoes the sentiments at such places as MSNMoney and The Simple Dollar. And even celebrity rich guys as diverse as Warren Buffet and Donald Trump are in on this one. Skeptical cynic that I am, my first instincts are always that popular trends are probably wrong, and that goes double if The Donald is involved. But I long ago learned to discount my instincts when it comes to big money issues. The argument in favor of buying a house now is simple and appealing. Prices are relatively low and when mortgage rates are factored in, houses are just plain cheap. This, it should be pointed out, is a much sounder argument than what you might have heard in favor of houses seven or eight years ago, that however expensive they were, now was a good time to buy because they were set to become even more expensive soon. But just how cheap are houses? According to the Case-Shiller 10 city composite, prices are down 35% from the June 2006 peak. That is encouraging, but it just means that prices are back to where they were in April ‘03. In other words, it could be argued that all that has happened is that we have returned to normal and that prices are not particularly low or high now. 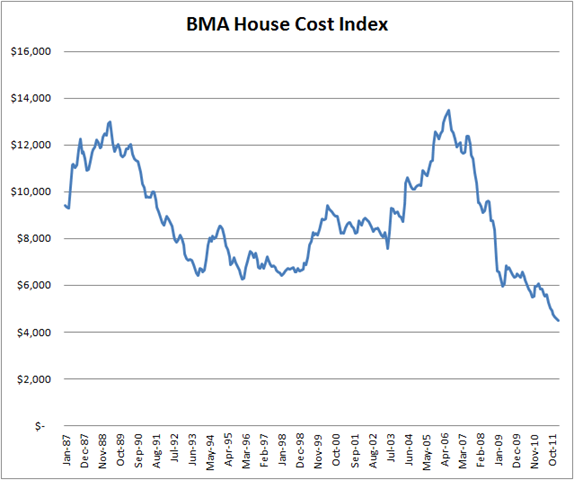 To get at that, I hereby launch the BMA House Cost Index. It aims to measure the real cost of real estate, rather than the price. (Or affordability.) The formula is pretty simple. I start with the good old Case-Shiller 10 city, which goes back to January 1987, and adjust it for inflation using the CPI. I then multiply that number by the average 30-year fixed mortgage rate as reported by Freddie Mac. The index is scaled to show what it currently costs to pay the interest for a year, in 1987 dollars, on what was $100,000 worth of house in January 1987. 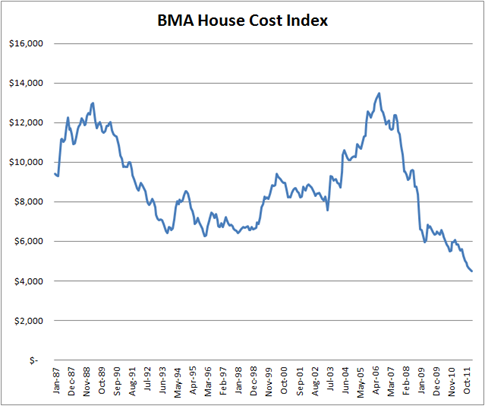 The current reading (which is for February 2012, the latest data point from Case-Shiller) of the BMA HCI is $4479, meaning that it now costs $4479 a year in 1987 dollars to float what was $100,000 worth of real estate back in 1987. That is down from a peak of $13,479 in July 2006, a drop of 67%. And the current value is now just over half the average value since 1987 of $8814. There is really no escaping the fact, illustrated in the chart above, that houses are now cheaper than they have been in a generation. Of course, like any index this is a simplification of a complex picture. The Case-Shiller 10-city composite is just a national average that may not accurately reflect reality in your local area or for any particular house. The index does not consider tax effects. Or the availability of mortgages. Or the inflation dividend you get from owning a house. But I think it gets the big picture right. So, in as much as houses really are cheaper than they have been in at least a quarter century, and possibly much longer, popular opinion seems to be on target. However, wet blankets like me need to point out that as cheap as houses are today, there is no law that says that they cannot get even cheaper tomorrow. All we can say is that this is a good time to buy a house, not that it will be someday looked back on as the best time. Frank, would love to get your thoughts on the housing bubble in Canada. In particular, Toronto is building more condos than NYC and Mexico City combined. It’s freakish, and we can’t even deduct our mortgage interest from our taxes. By so many metrics, including rents to house price and household income to house price, it’s a terrible time to buy a house. Or a condo. But people think “it’s different here”. Why on earth would that be? But this is only looking at the interest on the loan, right? Without also including the principle I think it paints only a partial picture. Per your method if housing prices doubled tomorrow but interest rates were cut in half then the chart would be flat. But this does not express the true cost. Nor would it express the now greater danger of interest rates increasing in the future and consequently dropping the price of housing. I hope it’s the time to buy; we’re aiming to close on our third house in June. Last year, we made a substantial upgrade in residence for no increase in month-to-month costs, and turned our original place into a rental. 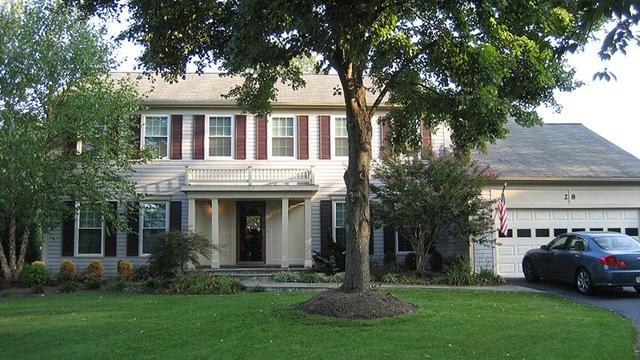 The third place is a small home in Knoxville, Tennessee, where prices are incomprehensibly low. We’re getting 15-year money for 3.3% and moving my wife’s sister in as a renter. If she pays the rent for fifteen years, we’ll mail her the deed. And if she doesn’t…the mortgage is like two hundred a month. Crazy time, this. We’ll be telling stories about it for the rest of our lives. If this weather holds, we might be looking for another property in 2013. This seemed like an interesting question to me, so I plugged Frank’s system into a spreadsheet using the Teranet index and CMHC’s “Average 5-year mortgage rate” data-set, which I could only find up to Dec 2011. I also tweaked it to compare both interest cost, and annual payment required to pay it off over a 30-year period. Basically, the interest rate adjustments show that the housing market is not as exciting as price indexes show. I have not figured out whether the Teranet index already compensates for inflation, or if I should add a constant-dollar adjustment as well. There’s less history available, but my impression is that most Canadian housing is a bad buy. Alberta seems to be an exception, where it looks like an average buy, having gone from one flat line before 2005, through a bubble, to a higher flat line from 2009 onwards. There is reason to believe there may have been a fundamental adjustment in the Alberta market during the 2005-2009 period given the ~30% increase in population. Thanks Neil! Our mortgages here are all variable rate and generally rates are 5 year duration. We can’t get a 30 year fixed here. I think condos in particular are a bad buy right now as the condo fees in Toronto are ridiculously high (even compared to Montreal and Vancouver) and the price of the condo is in bubble territory even without the fees. The lack of 30 year fixed mortgages does make buying during low-interest/high-price markets a worse option for Canadians than Americans, since it limits their ability to ride out a high-interest/low-price period, but doesn’t really affect the tables I made. I used the average for 5-year fixed rates issued, which seems to be the most popular option for Canadian mortgages (a sizable minority do run with truly variable rates, which would be cheaper). The market as a whole doesn’t seem to react to that higher risk as far as I can tell, and is probably just assessing based on whether they can afford the payment the bank puts in front of them. Not surprising given the number of homeowners that can’t do math. It does raise significant concerns about what happens when interest rates rise substantially. Frank, I would love to get your opinion about the current generation (future homeowners) whom we read about being crushed with student loan debt never seen before. It seems to me, as they pay down this debt, purchasing homes will be put off, keeping prices “cheap” for quite some time. What do you think?